My helper, Kavita has never been to school. She’s in her early twenties and has three children, the eldest one is five years and the youngest is few months old. Her five years old started going to school this April. One day she said, “I pay 150 rupees for her extra tuition. I and my husband have never been to school, so we don’t know how to help her.” It set me thinking. I told her I can help the child on Sundays. “Bring her along with her books,” I said. Today this child came home with her small school bag; on her way to my home she had purchased a pencil and a notebook. As soon as she came in, she sat cross-legged on the carpet, put her bag in front of her, took out her notebook and pencil and started sharpening the pencil. She didn’t speak a word, nor did she look at me. I asked her if she goes to school and she nodded her head – confident buy shy; As if observing everything, taking the time to decide what way to respond to a new teacher. She waited for my instructions. I knew her mother works very hard, and the new notebook that she had just opened isn’t an easy purchase. I looked into my books and found an unruled notebook. I stole her sight and gently tore the two pages I had scribbled in a recent conference. I handed it over to her. I didn’t want my act of tearing pages to catch on her mind as a fun activity. I didn’t want it to be embedded in her mind as an insensitive act either. I was sensitive to what I was imparting her through my behaviour. I asked her to write what she knows, and she started to write, “1,2,3,4,5…..” It went on till ten. I asked her to read it along. I asked her later to hide what she has written with her hand and write again. When she forgot to write six, I asked her to peep through her hand and find out what it was that she forgot. For her, the fun was more to play hide and seek with numbers. It was a play to make mistakes, forget and then learn from one’s own self. All this while I spoke and instructed her the least, there was no anxiety in my bearing, no bearing of being a teacher – I was just a helper to her, the way her mother is to me in the kitchen. Next, we went on to draw; I asked her to draw a flower. “Have you seen a flower? Draw what you have seen,” I said. And this is what we did together. The first two, smaller ones are done completely untaught. Then I drew a flower and asked her to draw her flower. Look intently my dear educators; both the flowers have a sense of character. While I drew something that’s comprehensible, she drew something out of sheer involvement. Her is an emotive drawing, mine is not. 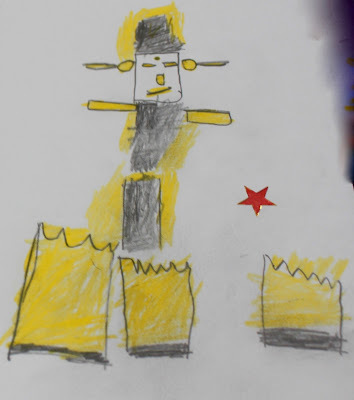 A professional artist may look into her lines, their boldness, their strength, fluency, rhythm and linkages and then decide if the child has a talent. It needs the skill to appreciate talent! It needs a sensitive, skilled, intelligent teacher to appreciate and nurture talent. And all the while a teacher teachers and nurtures the skill, he/she simultaneously imparts behaviour and character by example. I observed that the more she got involved in colouring and drawing, the more she turned verbally expressive in her native tongue, Bhojpuri. I realized how important her native tongue is in tuning her to herself and to build her comprehension and learning abilities. Language reinforces identity, character and confidence – native language and learning abilities are closely linked. I thought I must find out more about this. 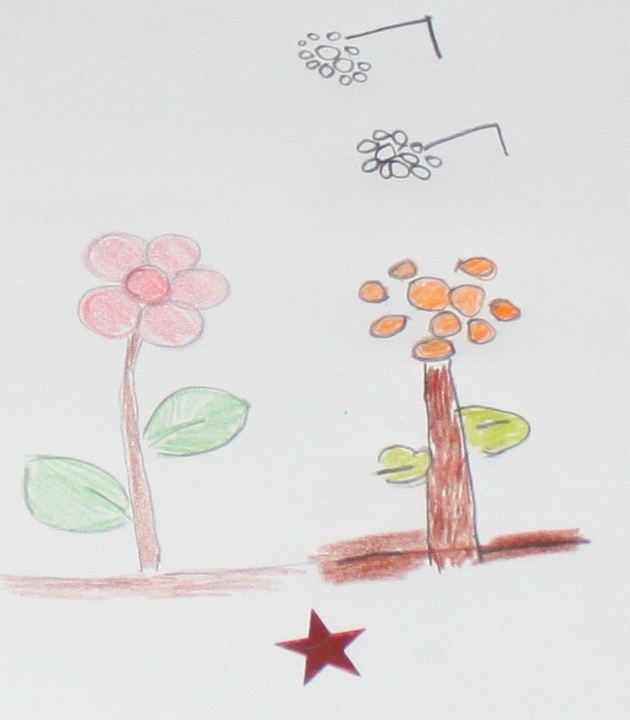 We finished drawing and colouring the flower. Her mother was cleaning the cupboard in the kitchen. Knowing well that this is the first time she’s drawing, I asked the child to draw her mother. Her eyes shone with joy and excitement and her mother had a childlike glee on her face. The child drew a straight line and then looked at me seeking instruction. I said, “Ok, this is one side of your mother’s face. Now you draw the other side.” So she drew the other side of the face – another straight line and then drew the chin. When it came to drawing her mother’s head, I asked her to look at the mother and figure it out herself. She ran into the kitchen to her mother, excitedly came back and picked up her notebook as if she had discovered some truth. The joy of discovery and learning is so inherent in everyone – more in children. Don’t we kill it by means of too much emphasis on setting things right? And our ‘right’ is laden with notions, negative emotions and expectations. We kill a child’s joy of learning by our ignorance of who a child is! Once she had drawn the boundary of the face, she turned confident. I didn’t try to correct her. I didn’t tell her that it’s not looking realistic or that it’s wrong. I was remembering myself as a child – how I was taught to draw a tree and all my life I stopped to draw how I saw and experienced things myself. I always wanted to draw like my father who had trained in an art college. He drew in my scrap book like he drew on his college assignment book. He always drew better than me. I still remember the helicopter I drew copying my teacher’s drawing when I was four years and because it matched hers, I received a ‘good’, and that delighted me. My friends frowned because they didn’t receive a ‘good’. More than three decades later those friends of mine are no less than I. But at that time, it created a false sense of superiority in me and may be jealousy in them. And can you imagine that in India, we have teachers accessing children’s drawings and grading them and giving marks? Can you imagine – what it does to a child’s emotional being? 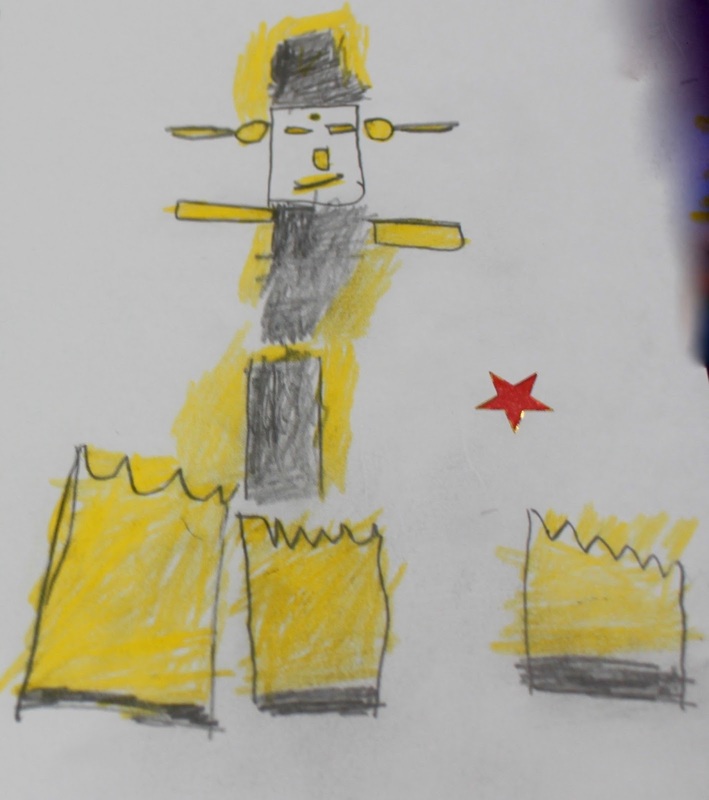 Educators need to understand that a child’s drawings are emotive drawings and not neutrally descriptive – they are reflections of a child’s developing ability of comprehension, they are pictures of a child’s emotions and world. They are of a CHILD. Getting back to my helper’s child, I just reinforced my confidence in her unfolding drawing and in her joy of discovery. I think by doing this I respected who she’s. I know only this can nurture her. I don’t want her to become someone else than herself. I don’t want her to grow up trying to become mentally, emotionally and spiritually someone else. I know the best way to nurture her is to tune her to her own abilities. When it came to drawing her mother’s legs, I observed that she didn’t draw two legs. She has been seeing her mother in clothes and to her eyes it appears the way she has drawn here. But my dear educators look at her lines, look at the fluidity and confidence in them. I hope I can build this up. I’m sure as her skills of detailed observation grow, so will grow her skills. When it came to feet, she had no idea what to do. So I asked her to look at her feet and draw and this is what she did. She drew them separately. I asked her to then draw a hand and she looked at her hand and drew it separately. We ended up our activity by colouring; she chose the colour, and she did it the way she wanted. We ended our activity by identifying and naming the body parts, and it was all so easy. ~ Venus Upadhayaya is a trainer and learner; you can contact her by email venusupadhayaya@gmail.com .